As one of the major carbon sinks in the global ocean, the North Atlantic is a key player in mediating and ameliorating the ongoing global warming. Current projections of the North Atlantic carbon sink in a high-CO2 future vary greatly among models, with some showing that a slowdown in carbon uptake has already begun and others predicting that this slowdown will not occur until nearly 2100. To ensure the credibility of future projections as needed for finding adequate mitigation strategies, it is important to address and reduce this uncertainty. Percentage of anthropogenically altered carbon stored in the deep North Atlantic (left panel) and North Atlantic uptake of anthropogenically altered carbon (right panel) as simulated by 11 different Earth System Models for a high CO2-future. Black x and line in left panel mark the observational estimate and its uncertainties, while blue and red shading reflect model spread, including models that simulate deep ocean storage within (blue) and outside (red) these observational uncertainties. A new study in the Journal of Climate identified some of the mechanisms behind this ambiguity by analyzing the output of 11 Earth System Models for a high-CO2 future. 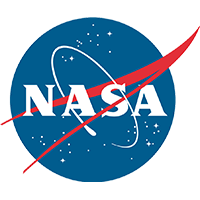 The authors show that discrepancies among models largely originate around high-latitude gateways from the surface to the deep ocean. Through biological production, deep convection and subsequent transport via the deep western boundary current, these gateways remove carbon from the upper ocean. When enough carbon is removed to maintain a lower oceanic pCO2 relative to atmospheric pCO2, the ocean continues to take up carbon. 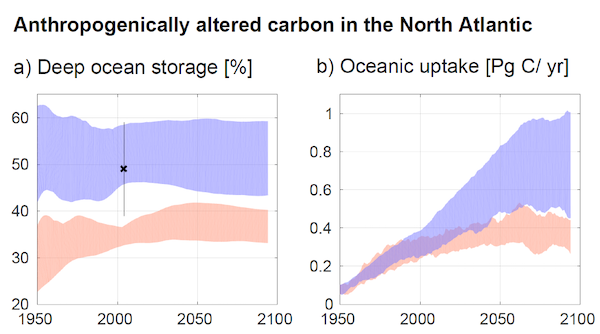 The study reveals that the fraction of anthropogenic carbon that is stored below 1000 m depth is not only an indicator of current carbon removal from the upper ocean but also a predictor of future ocean carbon uptake. 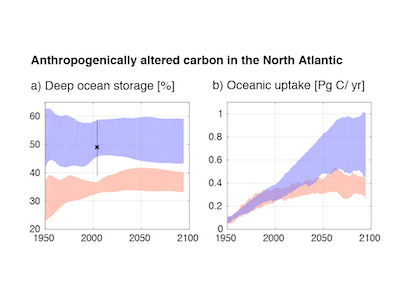 When models that lie outside the range of observational uncertainties in deep carbon storage (red shading, left panel of figure) were excluded, revised projections showed higher North Atlantic carbon uptake in the future with lower associated uncertainties (blue shading, right panel of figure). This result highlights the need to depart from the concept of more or less randomly chosen models when reporting on future projections and their uncertainties. 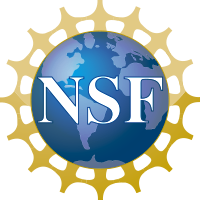 Results that are more reliable and hence of better use for mitigation strategies can be gained by focusing solely on models that simulate key mechanisms within observational uncertainties.